Find Out the Best: Personal Reviews and a Detailed Guide! Greetings! I’m a construction enthusiast that loves writing wifi thermostat reviews. I’ve spent years researching the innovative technologies that provide the best home comfort solutions. Many people do not realize the important role their thermostat plays in having a comfortable, healthy and efficient home. Since you’re reading this, I know you’re among the more sensible and attuned. I admire your desire to provide the best home possible for your family. Wifi thermostats are among newest products of the recent smart home trend. Many brands have released smart thermostats into the market including: Honeywell, Nest, ecobee, Lennox, Daikin, Trane, White Rogers and Carrier. Finding the best wifi thermostat among all the brands and models can be difficult. Therefore, I created this ultimate resource to help with this! It contains detailed reviews and an objective analysis of all the top wifi thermostats. Now there’s no need to search multiple websites for wifi thermostat reviews. All the wifi thermostats out there get the basic job done of cycling the HVAC system on and off to maintain a reasonable comfort level. However, I wanted to save my readers the time of doing all the research on their own to distinguish the best. 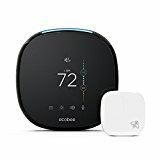 I’ve included my concise personal list of the Top 6 Wifi Thermostats, each with a detailed review. What makes wifi thermostats so different form normal thermostats is their ability to connect to wireless internet. Wireless opens up many possibilities such as displaying the weather forecast and live weather updates. Wifi thermostats allow remote access via a web, iPhone, or Android application. 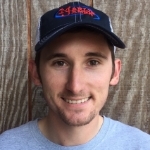 Some features most brands include are checking the interior and exterior climate of your house, adjusting the temperature, and even viewing performance reports. 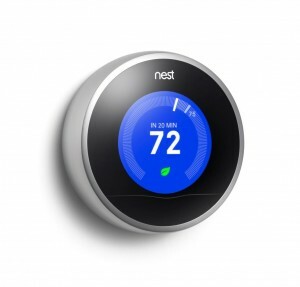 Since the introduction of the Nest thermostat, it has reinvented the smart thermostat market. I’d argue it was responsible for creating the market. Anyone that sees it can not deny its beauty. The sleek, modern metal ring just begs to be touched. The Nest thermostat learns more and more as days pass, calculating powerful algorithms. It would use this data with the data gathered from its motion and light sensors to know its owner better than the owner. If you’re wanting a thermostat for this purpose then look no further. A “smart” thermostat with a slick app that displays historical data. But for many, the features just aren’t there yet. The temperature fluctuations are broader than most, +/-2 or 3 degrees. One HVAC service technician wrote on Amazon regarding buggy software updates, stating that the Nest is not an iPod, a buggy update can lead to much bigger problems including not turning the system off or on, or simply the Nest not responding. The Nest wifi thermostat has definitely stirred up the industry but for some, it hasn’t been pleasant. However, a few of my friends have had great joy in using the Nest thermostat. Turning the wheel and viewing their energy efficiency is such an awesome experience, they could ignore the features they have given up. The 3rd Generation Nest is definitely a step in the right direction! 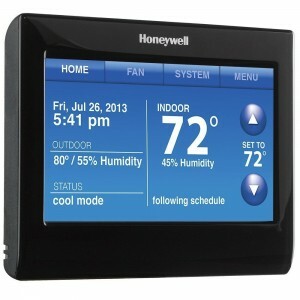 If you’re wanting the best, look no further than the Honeywell Smart Thermostat with Voice Control. Imagine sitting on the couch with you significant offer, “Baby it’s cold in here.” This unit comes with an awesome feature called far-field voice control. Simply say, “Hello, thermostat, I’m feeling cold.” and the thermostat changes setting by 1 degree. There are many pre-programmed commands to tell the thermostat an action you’d like it to perform. Many reviewers on Amazon are raving about how awesome and reliable the voice control feature is. The unit has a very user friendly interface, very snappy and responsive. Flexible scheduling breaks away from the standard 7-day programming of other thermostats. It will allow for very unique schedules with 4 programmable periods per day. The wifi thermostat also features smart response learning to better understand your heating and cooling needs. Again, if you want to spend a little extra, the Smart Thermostat with Voice Control is my top pick. Note: this wifi thermostat requires a c-wire. This unit is very similar to the above but lacks the Voice Control feature. The Smart Thermostat is an excellent choice for anyone not wanting the extra feature of being a couch potato. The interface is one of the top in the market, easy to use and looks great. I love it’s simple design thats blends well with any home, especially with the ability to customize the screen color. The 4 tabs at the top provide quick access to controls and settings. The Total Connect Comfort App and website has proven to be reliable. It’s a free service that allows you to remote access your Smart Thermostat anyway. 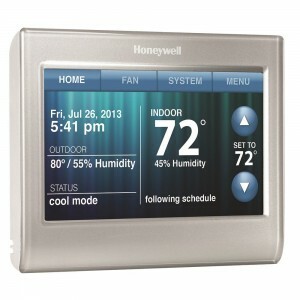 Honeywell has proven to be the leader in reliable thermostats that last for years so you really can’t go wrong. Note: this wifi thermostat requires a c-wire. Sensi has pushed the more simple side of wifi thermostats, keeping the traditional look and feel of a thermostat. Is it touchscreen? Nope. That might come as a surprise but many people are still not fond of touch screens. It actually uses physical buttons, something none of the other smart thermostats feature. My grandparents hate touch screens so they wouldn’t notice the difference from their old style White-Rogers they’re used too. They’re a bit stubborn when it comes to technology but I could see them loving it. Older folks tend to forget about saving energy. Therefore, the family could remote access into their thermostat, making sure they turn it up before they leave for the weekend. Many wifi thermostats require a c wire, the Sensi thermostat gives you the true flexibility of universal installs because no c wire is needed. The free iPhone and Android app brings the thermostat to your pocket. The Sensi service subscription that powers this magic is free also. 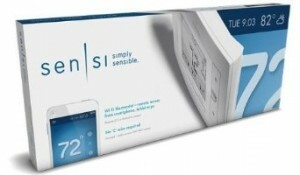 The Sensi wifi thermostat could be for anyone else that just doesn’t care about a touchscreen thermostat as well. It has all the grey features of the other, 7-day programmable, 4 heat/ 2 cool, and industry leading temperature to +/- 1 degrees. 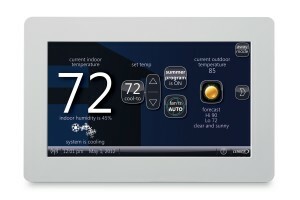 The iComfort smart thermostat is truly a beauty. The outer rim reduces in size as it extends to the wall, making it seem to just float. The wifi thermostat can be remote accessed through the iComfort app and website. One feature that many smart thermostats do not have yet is Weather on Demand – live weather alerts and the 5-day forecast. An awesome feature when running late to work. If you’re heading out just tap One-Touch away to save energy when no one’s home. Updates to the thermostat effortless. They Install automatically over the wireless internet! The unit supports most systems including heat, cool, multistage, conventional, heat pump, proportional control, dehumidify, humidity, and more. The unit interface is one of the finest I’ve seen. Taps are quickly recognized and the screens load very fast with little sluggish delay. Lennox has partnered with Gelaskins to make your wifi thermostat personalized! If you have a wood wall, take a picture of it, order a Gelaskin for the thermostat and set the picture are the background. It will be camouflaged! haha You can’t go wrong by choosing the iComfort Wifi Thermostat. I highly recommend this product. Note: this wifi thermostat requires a c-wire. Adjust to schedule changes. The wireless thermostats allow you to use a companion app anywhere internet access. If you’re staying out late, making a last unplanned trip with friends, or staying an extra day on vacation, you can allows open up the app and make an adjustment. 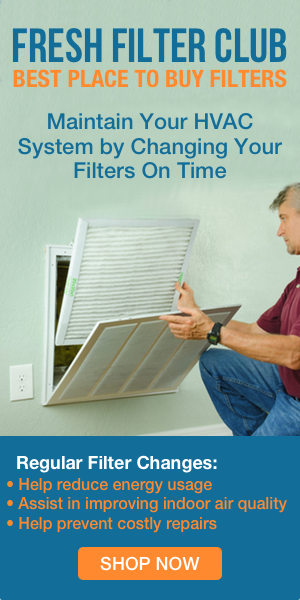 These may seem like small changes but they will add up in energy saving quickly. Reprogramming made simple. The wifi thermostat can adjust automatically to daylight saving time. Programmable thermostats have menus that make it frustrating to setup an initial 7-day programming schedule, let alone making adjustments later. Smart thermostats have nice interfaces that make scheduling a simple task. Check in. As a homeowner, it provide a peace of mind knowing I can keep an eye on my home at all times. I have the Honeywell Smart Wifi thermostat so I get an email notification every time my home gets too hot or cold. Maybe the system is having a problem or it’s just a really hot day here in Florida. Usage reports. Many units now provide detailed energy reports, such as the Nest and ecobee, to keep the you engaged in the usage. Couch potatoes unite! “Baby, I’m cold.” launch the app and satisfy. The Honeywell Smart Wifi Thermostat with Voice Control takes it even further. Just say “Hello thermostat, make it 2 degrees warmer.” Your significant other will be amazed. Charming. The new wave of wifi thermostats are finally changing the ugly white squares of the past into modern looking masterpieces. Many smart thermostats require a C Wire. The C wire or “common wire”, provides 24 VAC power to the thermostat. If you do not have a c wire, you can still choose from a few smart thermostats that do not require a c wire. The ecobee provides a PowerPack that essentially creates the C Wire. Nest recommends having a c wire but doesn’t not require one. Sensi is another great option for installations without a c wire.